You are here: Home / Featured Article / The Long Raid, Good Knyght: A Darkhaven Exclusive Interview! To prepare us for the exciting new content coming out, GW2 Dev Paul Ella, a Darkhaven native, was gracious enough to sit down with Darkhaven.US to chat about the upcoming Raids in GW2!! Paul has been an active part of the Darkhaven community, previously participating in the Adopt-a-Dev program with Non Verbal Persuasion [NVP] (read more about his experience in a previous interview, here!) serving as trebuchet practice for the opposing team and hopping into TS3 on numerous occasions to chat and just hang out!! An all around awesome dude whom lives a secret double life as a rock star (seriously, ask him about his tat’s) we are proud and honored to count Paul as a Darkhaven Son! 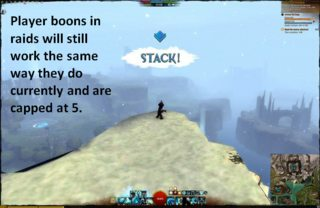 Before we get into the interview though, let’s take a moment to revisit what Raids are and what makes them so awesome and different in GW2!! 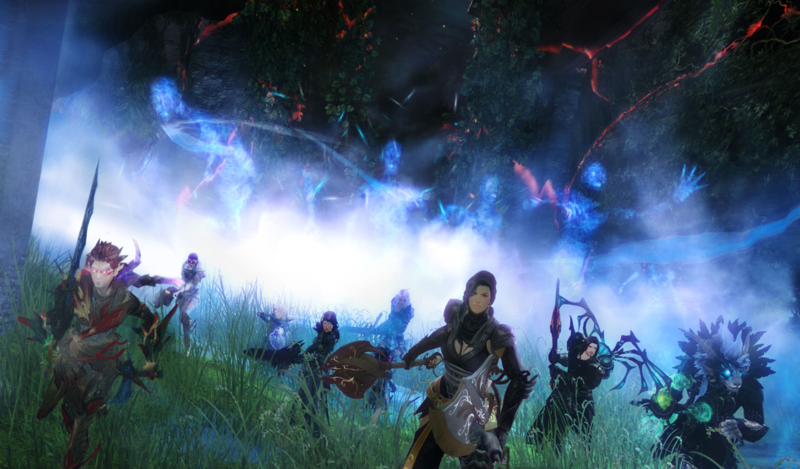 Raids are the ultimate challenge in group play in Guild Wars 2: Heart of Thorns. They are 10-player instanced content where players use newly acquired abilities such as Masteries to overcome ever-increasing challenges and epic boss encounters. The action-based combat system replaces UI-gazing found in other MMOs’ raids with active strategies like weapon and ability changes on the fly in combat, skill combos, dodge rolling, positioning for attacks, and the ability to heal for every class. Paul, thanks so much for sitting down and taking the time out of your hectic schedule to chat. Previously you were the Release Product Owner responsible for getting updates out as scheduled however we understand you’ve changed roles? Can you tell us what you’re doing these days? As a Producer for ArenaNet I work with the team to create development schedules, track deliverables, manage timelines, schedule reviews, etc. etc. Overall project management for the raids releases. Previously I produced such classic projects as Heart of Thorns Prepurchase, SMS and Play For Free. Oh wow, a Producer! How does that tie into the new Raids coming out in GW2? 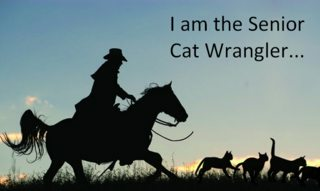 *Snicker* Cat Wrangler–that seems like such an apt title!! Well, obviously as the Producer for Raids, you’ve had some hands on time in the content. What have you enjoyed the most in developing these Raids? So raids are fueled by player tears due to a maniacal and over-zealous English A-net Producer, got it. 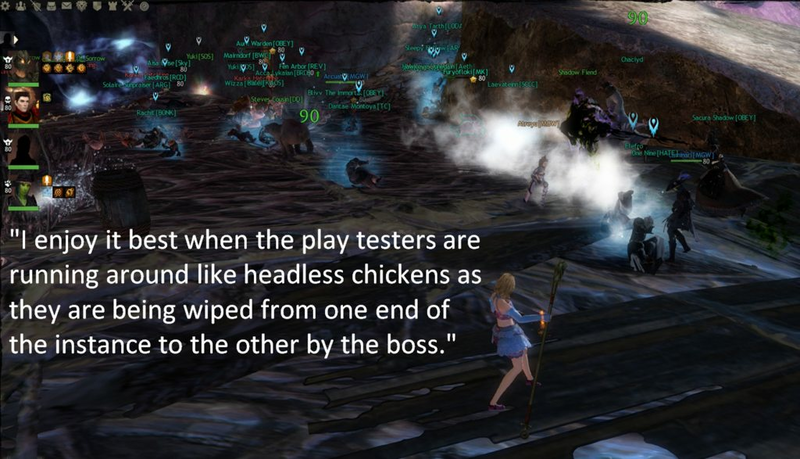 (*jot’s note down* must speak to Colin about hiring foreign nationals…) Well speaking of the difficulty, the beauty of GW2 is how it can accommodate such a wide scale in player skill range, from the casual to the super-hard-core. Where do Raids fall in the skill range? 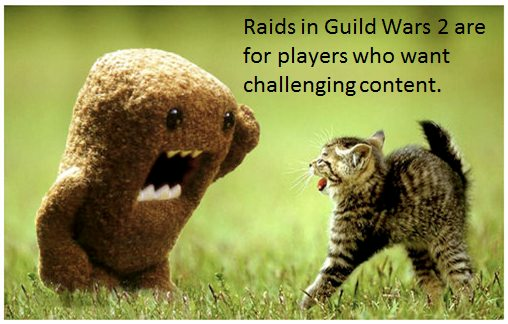 Raids in Guild Wars 2 are for players who want challenging content. Ah, so it sounds like Raids will be weighted towards the high end of the skill range. How would you recommend players increase their skill levels so they can prepare for the content in Raids? Our open world PvE content is the perfect place to hone your skills so you can try raiding later on if it feels too difficult right now. Right on, so the tools players need is already built into the game. Outside of player skill level, we know there will be certain masteries we’ll need to bring into the Raids such as gliding or mushroom jumping. Will there be a minimum masteries level requirement for Raids? 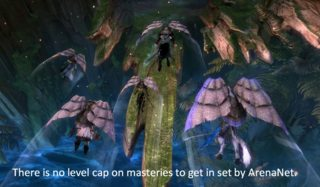 There is no level cap on masteries to get in set by ArenaNet. There are masteries needed for some encounters but they are listed on the entrance to the raid and are not deep in the mastery paths. We don’t have attunement quests in our raids. Masteries can be gained doing a variety of content in the game and provide new abilities that are useful in many other parts of the game. And not all masteries will be hard gates for encounters. In some cases they will just provide a benefit or only be required by a subset of your squad. What’s more, the experience you gain in each raid will give you a lot of experience that you can then spend to train other masteries. Not having attunement quests to open the Raid rocks! 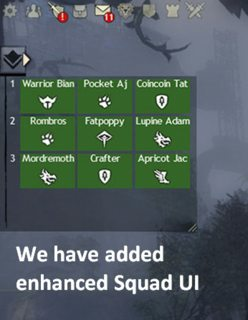 Well, since it’s a 10 player instance, will the 5 player cap on buffs be extended to the entire party? Player boons in raids will still work the same way they do currently and are capped at 5. We’re against raising the cap to 10 players since we don’t like the idea of the super group approach to building your raid composition. A super group would be taking one of every single profession, and then locking yourself into specific trait lines that passively increase the damage output of your group. These passive increases are also multiplicative so it would blow out balance very fast and we’d have to balance everything around the super group composition first instead of roles. From a design standpoint this would make designing raid encounters, and the roles associated with each encounter, much more difficult and limiting. From a player stand point it puts a lot of additional pressure on raid leaders/recruiters. It’s not going to feel great when someone can’t show up one night and the substitute raider is not the desired profession. Okay, that makes sense. I suppose old habits are hard to break in terms of “dedicated” roles. =) Well speaking of the instance itself and the megaservers, how will starting the Raid work if party members are on different IP’s of the same map? As they are on MegaServer tech the IP doesn’t matter. When you form a raid squad and enter the instance the megaserver will put all the raid members into the same map. Great!! So people don’t have to ferry into the same map! Switching gears, we actually have some questions submitted from Darkhaven users, if you don’t mind going through them? Specifically Vael Victus asked: I want to know if we’ll need to do very specific things in order to forge our legendary armor. Like how we have to go through masteries and collections. The approach to acquiring Legendary Armor will be very similar to how you get the other new Legendaries, through a series of collections and recipes, except intimately associated with Raids. Maz also of Darkhaven wanted to know: What will they do about raid frames? As of now there is no system in place to actually build a proper raid group. And finally, Rocket Dog wanted to know: Can we have a Quaggan mini-boss that taunts players with quippy Quaggan sayings!! Not unless it was 100 feet high and wasn’t a Quaggan. Also, can you please have him stop trying to hump my leg? Yeah…that’s the last time we let a talking dog into the interview booth. Anyway, moving on, thank you so much Paul for your time and please tell your team a hearty thank you from all of us for their dedication and hard work!!! We’re really excited about the new content and all the interesting and creative ways the Raids team has come up with killing us!! Don’t have Heart of Thorns yet? Well what in the world are you waiting for!? Click here and pick up a copy today!! Then be sure to check out our Guild Page here to find some cool peeps to enjoy the content with and join us on TS3 at ts.darkhaven.us! Not on Darkhaven or want more info about us? Contact us today!! We’d love to hear from you!